She might have been more famous as an actress in the decades following her athletic career, but Cathy Rigby’s success as a gymnast helped popularize the sport in the U.S. at a time when it needed it most. Rigby, who competed in the 1968 and 1972 Olympics – including taking 10th in the all-around at the Munich Games – won the silver medal on balance beam in the 1970 World Championships in Ljubljana, Yugoslavia. The feat made her the first U.S. female to win a world medal. Rigby was also the USA’s first event finalist ever in the competition. The U.S. team was selected by the AAU that year. In Munich, Rigby’s placement was the highest for the U.S. in the women’s all-around in the Olympics to date. In all, four American women were in the top 36, a big achievement at that point. 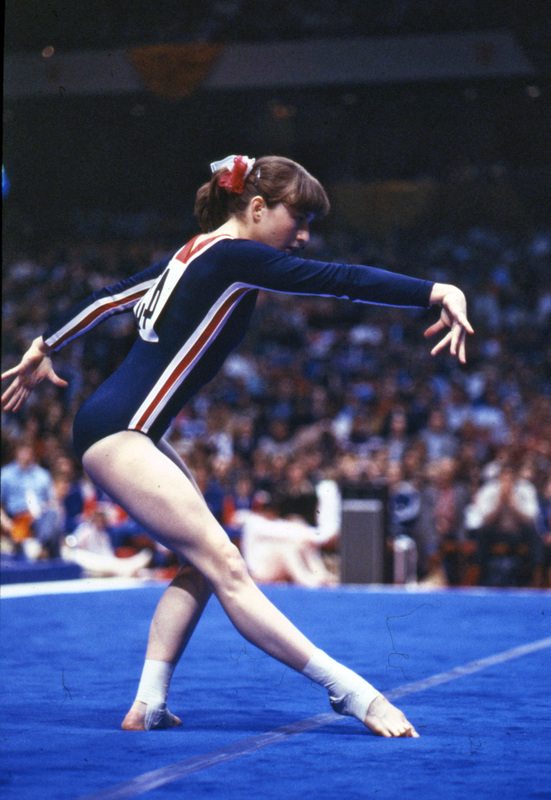 Competing in just her second international competition, Marcia Frederick made a lasting impression at the 1978 World Championships in Strasbourg, France. Frederick won a gold medal on the uneven bars, the first ever for an American female in the world competition. 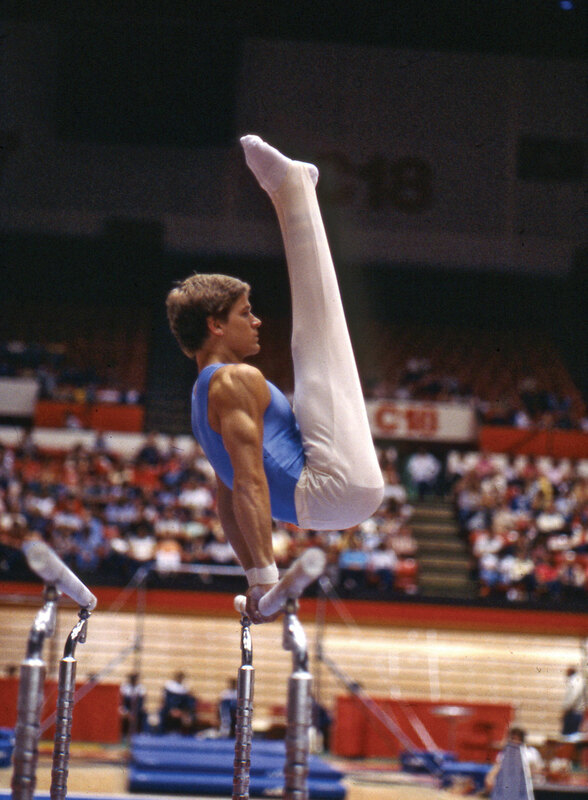 Going into Worlds, Frederick had a reputation for difficulty on the apparatus. Among her tricks was a Stalder shoot, which no one had performed before. Frederick was unfazed by her competitors at the event, which included 1976 Olympic all-around champion Nadia Comaneci of Romania. But Frederick bested Comaneci and the rest, scoring 9.95 for her routine. Comaneci posted a 9.85 and failed to win a medal in that event. Frederick qualified for the 1980 Olympics in Moscow but didn’t compete due to the U.S. boycott after the Soviet Union invaded Afghanistan. 1984 Men’s Olympic Team: Although the 1984 Olympic Games in Los Angeles didn’t include the Soviet Union – which boycotted the Summer Games in retaliation for the U.S. not competing four years earlier in Moscow – there’s no question that success would have christened the American men’s gymnastics team. Yes. They were that good. The U.S. squad that year became the first to win the Olympic team gold medal. The members were Bart Conner, Tim Daggett, Mitch Gaylord, Jim Hartung, Scott Johnson and Peter Vidmar, with Jim Mikus as the alternate. Four of the six gymnasts won medals in individual events: Vidmar, gold in the pommel horse and silver in the individual all-around; Daggett, bronze in pommel horse; Conner, gold on parallel bars; and Gaylord, silver in the vault and bronze in both the parallel bars and still rings. They were a remarkable team at the 1984 Olympic Games in Los Angeles – one of the most influential coaches in gymnastics history leading the petite but powerful Retton into America’s hearts as she became the first U.S. woman to capture not only the Olympic all-around title, but also an individual medal of any color. Although the 1984 Games were affected by the Soviet Union-led boycott, it failed to diminish the excitement generated in the U.S. following Retton’s groundbreaking performance. Karolyi is indelibly linked to both: He was the personal coach of Comaneci, leading the 14-year-old Romanian to the all-around gold medal at the 1976 Montreal Olympics. During those Games, there was a youngster in Fair- mont, W.Va., who was watching the drama unfold on TV. 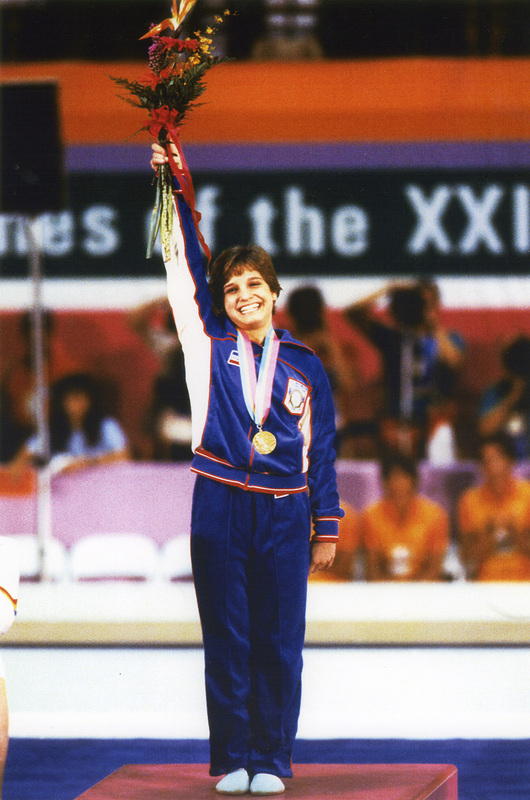 To say that Retton was inspired by Comaneci’s performance – which included during the team competition the first perfect scores of 10 for her performances on the uneven bars and balance beam – would be an understatement. The Romanian was dominating: In addition to winning the all-around title, Comaneci earned a total of seven perfect scores during those Olympics. A year before the 1984 Olympics, Retton moved to Bela and Martha Karolyi’s new facility in Houston to train under the former Romanian gymnastics coach. Karolyi believes that Retton’s humble upbringing in West Virginia added to her drive to become an Olympic champion. The chance for Retton to become the sweetheart of the Olympics almost didn’t happen; she injured her knee and had surgery six weeks before the Games. In the all-around final, Retton battled Romanian champion Ecaterina Szabo. She trailed the Romanian by .15 of a point with two rotations to go but rose to the occasion, earning 10s on the floor exercise and vault. Before Retton stuck the landing of her full-twisting layout Tsukahara, Karolyi was confident that her hours of training would lead her to victory. The final score: Retton 79.175 to Szabo’s 79.125. Retton also won a silver medal in the team competition, and captured individual medals in the vault (silver), floor exercise (bronze) and uneven bars (bronze). Her five medals in 1984 were the most of any Olympic athlete. She was the first woman to be featured on the front of a Wheaties’ cereal box. Bart Conner was already a household name when he won two gold medals at the 1984 Olympics in Los Angeles. Many fans were aware of how Conner had battled through painful injuries throughout his career. In 1980, he won the U.S. Olympic Trials but tore a bicep muscle, which would have kept him out of the Olympics. The U.S. boycott of the Games in Moscow, however, kept all American athletes from competing. So when he suffered another muscle tear in his arm at a competition in Tokyo in late 1983, there was no doubt he’d try to recover in time for his third Summer Games. Conner was part of an epic men’s team at the ’84 Olympics – the USA’s first to capture the team gold in an upset over the World champion China. He also won for the U.S. its first event gold medal on parallel bars. 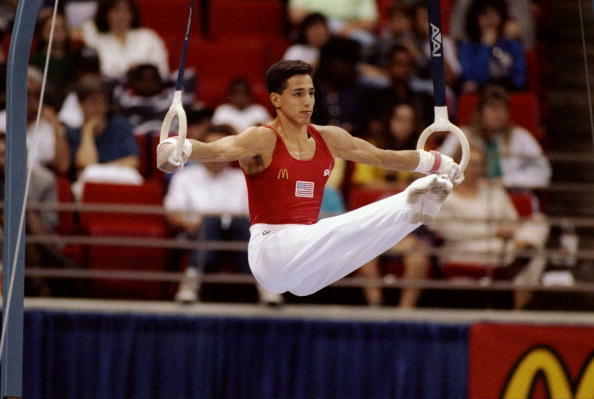 Conner retired from competition as the only American male gymnast to win gold medals at every level of national and international competition. 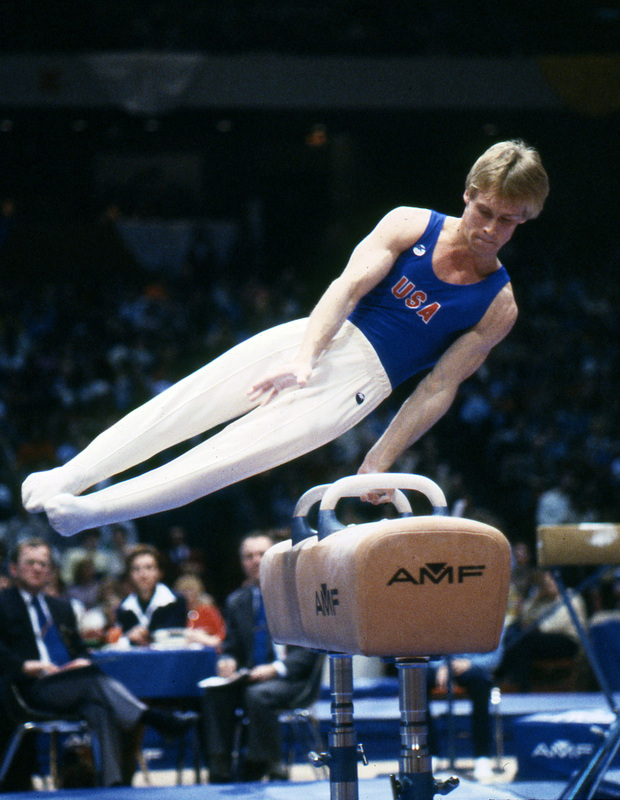 He captured two major internation- al titles in 1979, winning the pommel horse at the World Cup and the parallel bars at the World Championships, both firsts for a U.S. gymnast. It was quite an Olympics for Peter Vidmar at the 1984 Olympic Games in Los Angeles. Of his three medals, two were gold. He was among the stars of the American men’s team that defeated China for the team gold medal. In the all-around competition, his silver made him the first U.S. man to medal in the all-around at the Olympics. Vidmar, though, had gold within his reach until Koji Gushik- en of Japan edged the gymnast in what was then the closest Olympic all-around competition in 60 years. Vidmar also tied for the gold in pommel horse with Li Ning of China, both finishing with 19.95 points. In the individual ap- paratus finals at those Olympics, each gymnast’s scores from the compulsory exercise and optional exercise in the team competition were averaged for a preliminary total. Then the score in the individual event final was added for a final score. Li went first on pommel horse and scored a perfect 10. Then Vidmar matched Li’s score, posting a 10 of his own. The two also each had the same prelim score. 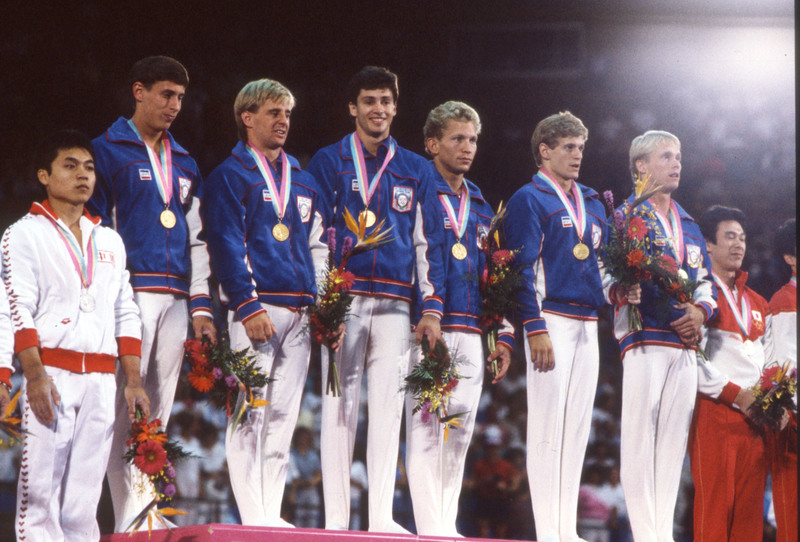 The performances of the U.S. men’s and women’s gymnastics teams at the 1984 Olympic Games in Los Angeles resulted in an abundance of firsts for the programs. Julianne McNamara was included among the standouts. She became the first U.S. women’s individual event gold medalist in Olympic history when she tied for first with China’s Ma Yanhong on the uneven bars. The gymnasts both posted matching perfect scores of 10 in the event finals. McNamara also won silver medals on floor exercise and in the team competition. She placed fourth in the women’s individual all-around on the day her U.S. teammate, Mary Lou Retton, became America’s sweetheart for her groundbreaking gold. The 1984 Games were sweet redemption for McNamara, Kathy Johnson and Tracee Talavera. The trio all made the Olympic team after they were denied the opportunity to compete after earning spots on the 1980 U.S. Olympic Team that boycotted the Moscow Games. Simply put, it was her time to shine. 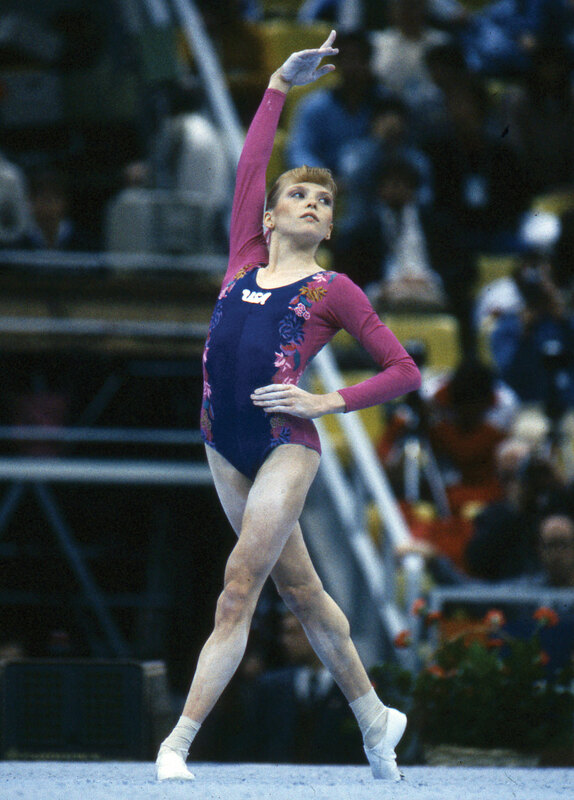 Heading into her final event in the women’s all-around competition at the 1991 World Cham- pionships, Kim Zmeskal had tied or outpointed reigning World champ Svetlanta Boginskaya of the Soviet Union on every apparatus. Her floor exercise routine would be no different. In front of 15,000 spectators at the Hoosier Dome in Indianapolis, Zmeskal scored a 9.987 en route to becoming the first World all- around champion for the USA. Four of the six judges scored her performance a perfect 10. It was a defining competition for the USA Gymnastics women’s program as well. Never before had it placed three members in the top six in the all-around at a World Championships, with Betty Okino taking fourth and Shannon Miller sixth in addition to Zmeskal’s gold. No American woman had ever finished higher than seventh at Worlds until then. Zmeskal won four consecutive U.S. titles from 1989-92: one junior and three seniors. With the U.S. Olympic men’s gymnastics team on the verge of being shutout of the medals at the 1992 Olympic Games in Barcelona, Spain, Trent Dimas came through in dramatic fashion. The Hispanic-American captured the gold medal on the horizontal bar, making him the first U.S. Olympian – male or female – to win a gold medal in a non-boycotted Olympics since Dallas Bixler won the same event in 1932. Having qualified in sixth place to advance to the finals, Dimas nailed his finals routine, including sticking his triple-back somersault dismount. His score: 9.875. Dimas’ victory redeemed the Olympics for the U.S. men, who finished sixth in the team competition. Until then, the American women’s best team finish had been winning the silver at the 1984 Olympic Games in Los Angeles, which were boycotted by the Soviet Union. As expected, the competition went down to the final event. After three rotations, the U.S. led by nearly a full point. The Russians were concluding on floor exercise, the Americans on vault. After Dominique Moceanu’s uncharacteristic miss on vault, the U.S. coaches and team believed it all came down to Kerri Strug. When she missed her first vault, falling back on her landing, her 9.162 wasn’t the only worry – she had also seriously injured her left ankle. On her second vault, Strug stuck the landing and hopped on her right foot before collapsing in agony. Her score: 9.712. She was carried to the victory podium by her coach, Bela Karolyi. The final tally: USA, 389.225, gold; Russia, 388.404, silver; Romania, 388.246, bronze. The Mag 7: Amanda Borden, Dominique Dawes, Amy Chow, Jaycie Phelps, Moceanu, Strug, and Shannon Miller. You can call Dominique Dawes the iron woman of U.S. gymnastics. The gymnast competed in three Olympics, winning team medals in all. 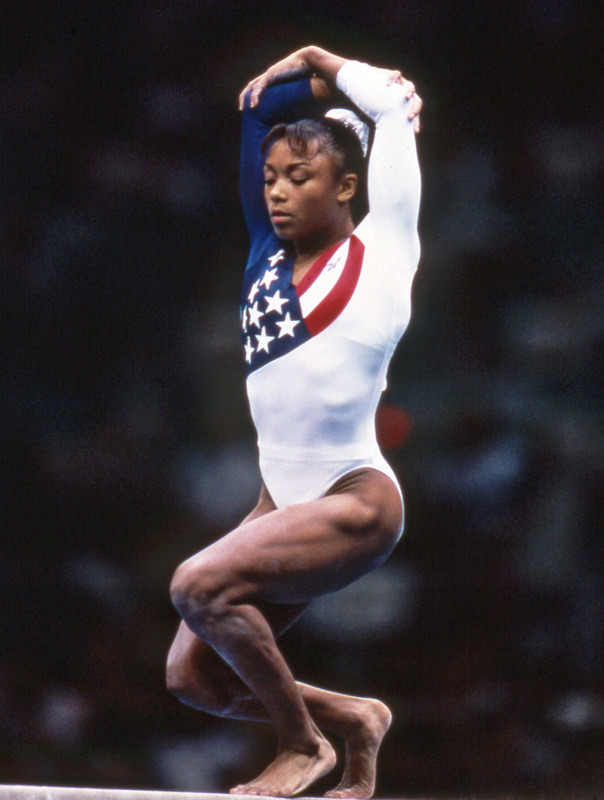 When she won a bronze medal at the 1996 Olympic Games in Atlanta on floor exercise, Dawes became the first African-American gymnast to win an individual medal in the sport. Dawes, a 10-year member of the U.S. National Team, also captured a team bronze at the 1992 Olympic Games in Barcelona, Spain, and was part of the Magnificent Seven’s team gold four years later in Atlanta. She was the only member to have all eight of her scores count toward the total. The American women finished fourth at the 2000 Olympic Games in Sydney, Australia, but were later awarded the bronze when the International Olympic Committee stripped China of its medal for an underage competitor. Arthur Davis and Shenea Booth became the first U.S. acrobatic gymnastics world champions in the mixed pairs’ event at the 2002 World Championships, and then became the only U.S. acro athletes to repeat as world champions when they successfully defended their title in 2004. They also were three-time U.S. champions (2002-04) and acrobatic gymnastics’ Athletes of the Year in 2003-04. The duo was awarded the Glen Sundby Award for Outstanding Pair/Group Performance in 2003-04 and earned awards for the Most Difficult Skill in 2002 and 2004. Booth was on the national team for seven years, and Davis was on the national squad for nine years. After retiring from competition in 2004, Booth and Davis performed as “Realis,” traveling to more than 20 countries around the world. In addition, they advanced to the final round of “America’s Got Talent” and have made guest appearances on “Dancing With The Stars,” “So You Think You Can Dance” Australia, “Today” and three ice skating/gymnastics events. 2003 U.S. Women’s World Team: Without question, the U.S. women had been building toward winning their first-ever team gold at the World Championships – not just during the 2003 season but for decades. Despite losing several gymnasts to injuries or illness leading up to the competition in Anaheim, Calif., the Americans relied on their depth as they rolled to victory, winning the world title by nearly two points. In the team final, the U.S. kept building up points, placing third on vault, third on uneven bars, second on balance beam and first on floor exercise. The world roster included Chellsie Mem- mel, Carly Patterson, Tasha Schwikert, Hollie Vise, Terin Hum- phrey and Courtney Kupets. The American women took the team gold with 112.573 points, just ahead of silver-medal winning Romania (110.833). tied for gold on the uneven bars.